A large, brilliant white bird, the mute swan has become a mythological character in fairy tales and Russian ballets. While floating, the mute swan maintains a posture of a curved S-shaped neck. downward pointing bill, and wings held in a slightly raised position above its back, and is readily identifiable in city parks, bays and lakes from the the Northeast & Mid-Atlantic, to the Great Lakes and on to the Pacific Northwest. 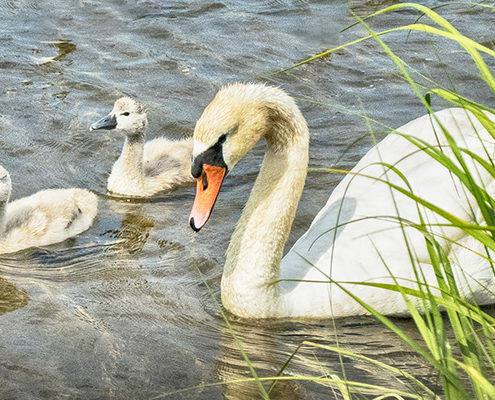 "Mute swans are not native to the US and therefore are not protected by the federal Migratory Bird Treaty Act of 1916, making it possible for states throughout this bird's North American range to actively manage populations," i.e., kill them. If a swan has been identified as needing rescue, it is very important for the person(s) rounding-up the bird to be wary of the bird's wings. A bite can leave a painful welt, but a full-force blow from a swan is powerful enough to cause serious injury to a handler. Care must be taken to during a rescue to hold the bird's wings against its body to prevent injury to both the bird and the rescuer. 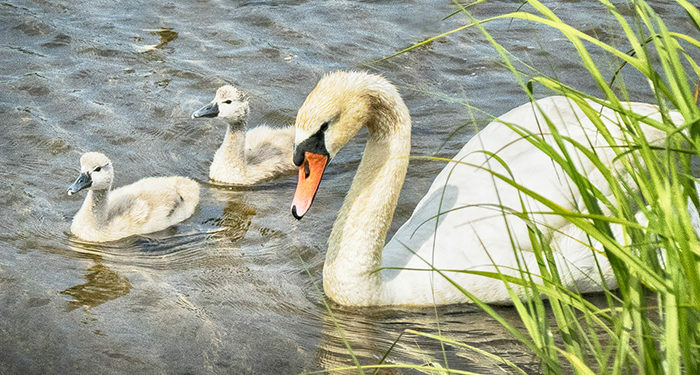 Cygnets who are still completely or mostly downy should be contained and brought to a wildlife rehabilitator for care if found alone, if after a period of observation no parent appears. Parents may have been temporarily frightened off. Babies found in man-made ponds or a pool are usually in need of rescue. As the young mature, and feathers replace down they will forage independently--no action is needed. The natural waterproofing ability of the swan may be affected by substances on their feathers--oil, glue, industrial waste, etc.--and if the swan appears to be wet it should be contained and treated. Adverse effects, if not treated, could be toxicity when they preen themselves, or hypothermia could set in, which could lead to death. If a bird has evidence of fishing line entanglement, being impaled by a fish hook, or having swallowed fishing-related gear--it should be brought to a rehabilitator for treatment. If the fishing line is wrapped, but not embedded, it might be possible for two people to contain the bird and remove the line without transport.